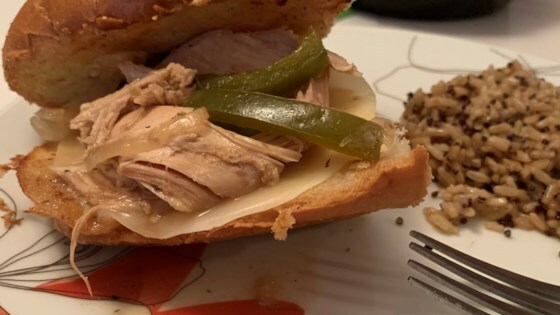 "This is a very delicious version of Italian beef using turkey. Serve on hard rolls or French bread with onion slices or pepperoncini." Dissolve the beef bouillon cubes in 1 quart water, and pour into a slow cooker. Place turkey in slow cooker, adding more water to cover if needed. Cover, and cook 8 to 10 hours on Low. Two hours before end of cook time, mix the vinegar, onion, green bell pepper, garlic, oregano, and Worcestershire sauce into slow cooker. Blend the brown gravy mix and water in a small bowl, and stir into the slow cooker, continue cooking 20 minutes. See how to make moist turkey breast slowly simmered with herbs and seasonings. Cooked x 8 hrs - smelled great, but had no flavor & had a pasty texture. This was OK - a little bland, but not bad. Next time I'll put in a little more oregano and worshire to punch up the flavor some. This was awesome and so easy!! My kids even liked it.